I return to a non-fiction title because I wanted something a bit different, and thought that with an introductory title I could find out whether the subject as a whole was something that I could see myself reading into more. Aesthetics sounded close enough to my prior studies that certain concepts would be less obtuse, but unfamiliar enough to still be interesting. 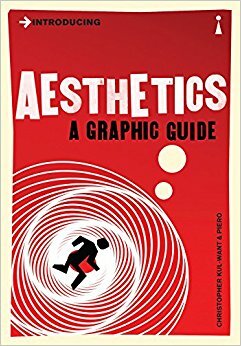 Introducing Aesthetics: A Graphic Guide provides a brief history of the development of aesthetics as a philosophy. It covers a period from the Roman Empire to the late 20th century, looking at philosophers ranging from Plato to Nietzsche to Baudrillard. Introducing Aesthetics really needed to be longer. At 171 pages that are about half the size of the average paperback, and around half of each page dedicated to illustrations, there's only really enough room for the barest of explanations of each concept that is discussed. And considering that over 2000 years of thought is being covered, that's really not enough space to adequately cover the material that it wants to cover. While you do get a general idea of how and why art has moved from having a singular objective Subject to a fragmented sense of self that can never be in possession of the entirety of a scene's contexts, it's not an especially clear route at times. In addition to that, I wasn't all that fond of the art style used for the illustrations. It's an odd style that is kind of half-caricature, and instead of quirky it just kind of came off as ugly. In addition, whenever there were reproductions of particular artworks, the quality of the print wasn't particularly great.